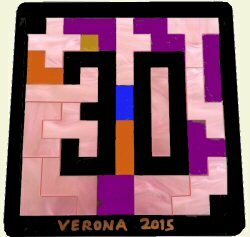 For Rose Squared Production's 30th Annual Verona Fine Art and Crafts Festival in 2015, we embedded the number 30 into a special edition of Poly-5. And because the organizers' name is Rose, we made the largest color area in a luscious pearlized pink. The puzzle pieces are lasercut translucent acrylic. We included a display stand, two game grids, and the 52-page instruction book. You can custom-order this design anytime for 30th anniversary occasions of your own  corporate or employee awards, wedding anniversaries, birthdays, etc. We'll try to meet your color requests. Price: $49. Email your inquiries to Kadon.